Unique Weta Tenzan Chainmaille sprung from a desire to make something that was comfortable to wear on long shoots, but that looked right and behaved believably on camera for The Lord of the Rings. 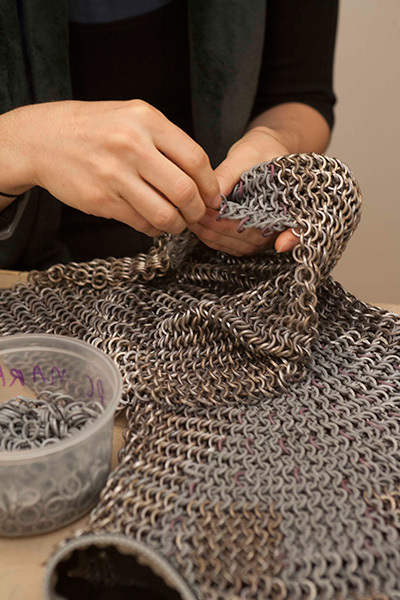 Weta developed a unique process that was used to create the hundreds of suits of chainmaille that were seen extensively throughout the trilogy. Learn the intricacies of how to make chainmaille, as seen in movies such as the Lord of the Rings Trilogy, Kingdom of Heaven, The Chronicles of Narnia and The Hobbit. Includes a Guided tour through the Weta Cave Experience.